"I'm planning to buy a house." It was a plan that suggested careful forethought, future planning and financial investment. In short, it wasn't one I had come up with anytime recently. The speaker in question was another faculty member who mentioned her plans to four of us who had gotten together to eat lunch and discuss alternative recourses to drowning students in duck ponds. "I told my boss I wanted to buy a house when I was older," she explained. "But he told me in Hokkaido, you buy houses young and move into an apartment when you're older." I stopped midway through cutting up an egg plant. "Why?" I asked. I had always looked at property purchases as good long-term investments; a place to feed money once you were settled and reap the rewards of an payment-free home after you retire. I could see some people wishing to downsize from the family home, but wouldn't most choose a smaller house over an apartment? "Because you have to be strong to shovel the snow." I glanced out of the window. Even in April, the campus lay under a thick frozen white sheet. "But… it's not the law to have to shovel the sidewalks here," I pointed out. At least, if it were the law, it was one absolutely everyone in Sapporo was blatantly ignoring. In Canada, you were responsible for the strip of pavement that ran outside your house. It had to be kept snow-free and gritted in the winter months. 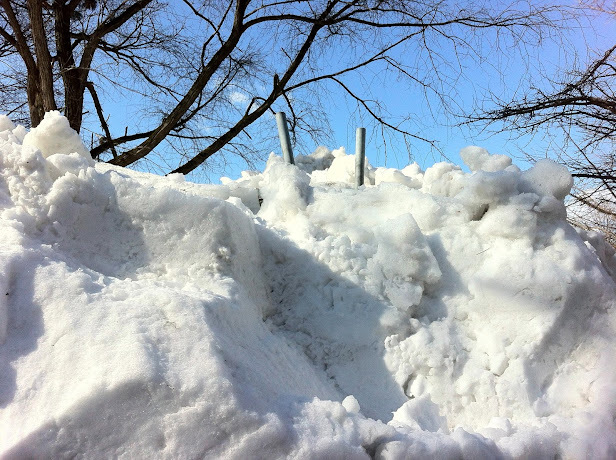 Here, the snow just mounted up to a compacted pile several feet thick. To be completely fair, I hadn't found Sapporo's policy of letting the snow accumulate to be a worse situation. Walkways shovelled in the morning could become icy death traps within the hour, whereas walking on fresh snow was relatively stable, even if you did have a large step down to the entrance of buildings. "No," my friend agreed. "But you do have to be able to leave the house." It was then I remembered the empty apartment building near my home. It was two floors and the upper level was reached by a outside staircase. This construction had been left through the winter to become a giant spherical popsicle as the snow had mounted on each of its steps and railings. I say the apartment building is empty; maybe it's more accurate to state that no living soul is in there now. So it was the difficulty in escaping from your own home in winter that put an age barrier on house ownership in Hokkaido. It turned out too, that house prices having been dropping in Japan since the end of the bubble economy, making property a poor investment. On the other hand, it perhaps beat paying rent that you can never recoup. "I need to stop thinking and just do it," my friend admitted. It sounded a bit like debating whether to have a baby; terrible investment that is limited by a biological clock. On the other hand, you get to finger paint the walls. As for the alternative to drowning students; our lunch get-together completely removed that pressing need. The view outside the canteen window told us all that the pond was nearly thawed.